This Easy Spicy Asian Chicken tastes like it came from a restaurant, but it’s easy enough to make on a work night and this tasty low-sugar chicken dish is also low-glycemic, dairy-free, gluten-free, and South Beach Diet Phase Two. Use the Diet-Type Index to find more recipes like this one. Click here to pin Easy Spicy Asian Chicken! Watch the video to see if you might like to make Easy Spicy Asian Chicken! I’m interrupting the string of Asparagus Recipes to remind you about this absolutely delicious Easy Spicy Asian Chicken that I think is perfect for a spring dinner idea! And something like Roasted Asparagus with Soy-Sesame Glaze would be a tasty side dish for this chicken if you’re still feeling the asparagus love. My niece Kara and I experimented with several variations of this Easy Spicy Asian Chicken, and this version was the winner! It’s made with strips of boneless, skinless chicken breasts and a sauce with sugar-free Apricot preserves, gluten-free soy sauce, rice vinegar, sesame oil, garlic puree, ginger puree, Chili Garlic Sauce, brown sugar, and granulated Stevia. The sauce is slightly sweet but still relatively low in carbs, and just spicy enough to be interesting. You can also use boneless, skinless chicken thighs if you don’t mind a bit more trimming. The sugar-free apricot preserves we used contain Splenda, but no worries if you don’t want artificial sweeteners, just look for no-sugar-added apricot preserves instead. That change will make a sauce that’s slightly higher in sugar, but still pretty carb-conscious for this kind of sauce. If you want to reduce the amount of sugar even more you can replace the tiny amount of brown sugar with more granulated Stevia or a sweetener of your choice. Finally, if you’re experienced at making stir-fry recipes, you might want to cut the chicken pieces a little smaller and cook this in a wok. That version will be delicious as well! Whisk together the sauce ingredients. Trim chicken breasts and then cut each breast crosswise into about 5 or 6 pieces. Heat the oil in a 12 inch frying pan; I used my favorite Green Pan for this. When the oil is hot, brown the chicken briefly on one side, seasoning with salt and pepper. 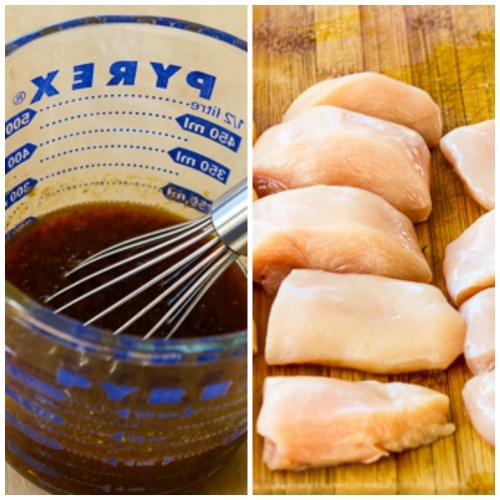 When chicken pieces are barely brown, turn them over, pour in the sauce, and cook on medium low (turning a few times) until the chicken is cooked through and glazed with sauce. Cook chicken just until it’s barely cooked through; do not overcook. Serve hot, with rice or Cauliflower Rice on the side if desired. Stir-fried vegetables like broccolini or sugar snap peas or Spicy Cilantro Peanut Slaw would also be great with this. This Easy Spicy Asian Chicken tastes like it came from a restaurant, but it’s easy enough to make on a work night and this tasty chicken dish is low in sugar for this type of recipe. Whisk together the sugar-free apricot preserves, gluten-free soy sauce, rice vinegar, sesame oil, garlic puree, ginger puree, brown sugar (or sweetener), and granulated Stevia to make the sauce. When the oil is hot, add the chicken pieces skin side down, season with salt and fresh ground black pepper, and cook over medium-high heat just until the chicken starts to brown, about 4 minutes. Reduce heat to medium low, add the sauce, and continue to cook the chicken in the sauce, turning a few time, just until chicken pieces are cooked through and glazed with sauce, about 4-5 minutes longer. DO NOT OVERCOOK or the chicken will be tough. Garnish with toasted sesame seeds if desired and serve hot. We used sugar-free Apricot preserves, gluten-free soy sauce, Chili Garlic Sauce, and granulated Stevia for this recipe. This recipe created by Kalyn and Kara, with lots of experiments that were not quite right! 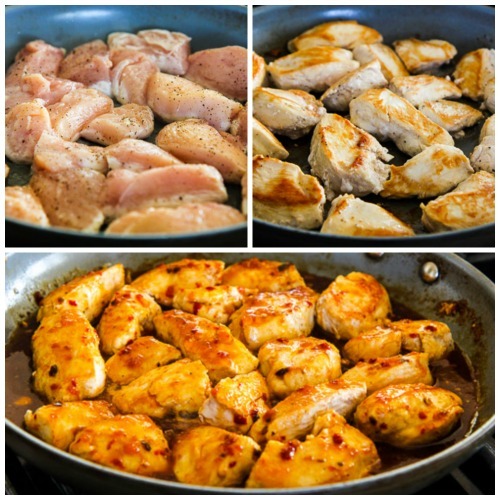 Since it contains apricot preserves and a small amount of brown sugar, this Easy Spicy Asian Chicken is best restricted to Phase 2 or 3 for the South Beach Diet. However, even with those sweet ingredients, this is still a pretty carb-conscious recipe for this type of dish. Skip the brown sugar and use all sweetener for stricter low-carb eating plans. This was delicious! I added in some green beans and onions for a one dish meal. As I was puting away ingredients, I realized that my sugar-free “apricot” jam was peach but it was wonderful nonetheless. Sweet, spicy, savory awesomeness! I love the idea of making it a one-dish meal; I need to try that! I made this tonight and I had a lot of chicken which gave off a fair amount of water when I tried to fry it. In spite of this (I drained most of the water off but left a bit too much) it turned out great! I also had misplaced my Stevia so ended up using 2 T brown sugar and the dish was really good – kind of a Sweet and Sour Chicken. So glad you enjoyed it! I hate it when the chicken releases water like that, but it usually doesn't affect the finished dish. This looks like a dish my family would love. Thanks for the link love. Barbara, my pleasure. I twas so good! This is perfect just as it is. I've got it prepped in the kitchen and we're good to go. I love the sweetness and hubs loves the hotness. Win-win. Thanks Maureen, hope you enjoy! This recipe has my name on it! I love the combination of sweet and hot. I'll probably add a bit more of the hot, of course…. Thanks to you and Kara for testing and tasting! Lydia, double the hot for you! Hope you enjoy like we did. This comment is not "honesty" it is just plain rudeness. I made it clear in the post that I realize some people won't want artificial sweeteners and offered a 100% natural alternative to that. So why the complaint? Just don't make this recipe if it doesn't appeal to you, but no need to lecture me and anyone else who like it. I followed your link and saw the ingredients on the chili garlic sauce. No lecture here. Thank you, everyone gets to make their own choices.